Video Production Tips. A must read! It’s great to see new people jumping into the San Francisco corporate video production scene. The downside is I see a ton of these newbies making a ton of mistakes. No matter what city you live in corporate video production is more than just grabbing an inexpensive DSLR and hitting record. Here is a great article from blog.hubspot.com that will help all those newbies from developing bad video production habits. Video content can be a valuable asset in your inbound marketing content mix. In fact, by the end of this year, video content is expected to represent nearly three-quarters of all internet traffic. But getting people to sit through your videos can be challenging, considering that the longer your video is, viewers will consistently drop off and stop watching, in most cases. Your video is being judged on its content, presentation, production quality, style, and the valuable information it provides. What does this tell us? Your content must be truly remarkable to maintain your audience’s attention. Download our free guide to learn how to create and utilize video in your marketing to increase engagement and conversion rates. Below are our tips to instantly improve the production quality of your video marketing content to give it a nice little boost. Be well-prepared and organized for your video shoots. If you show up to your shoot unorganized and decide to “wing it,” your final product will look unprofessional and sloppy. On the other hand, if you’re prepared, you’ll be able to focus your efforts on directing your actors rather than figuring out last-minute logistics. Time is of the essence, so don’t waste hours trying to figure out which angle you want or what line needs to be delivered next. Know exactly what you want before the day you film by following the steps below. 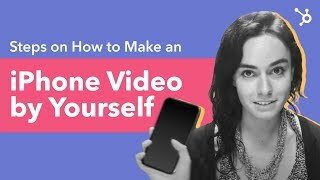 The concept for your video project should be original and creative. Don’t take the easy route and copy someone else’s idea. Instead, conduct persona and keyword research, find out which types of video content are popular and successful in your industry, and double-check to make sure another brand hasn’t covered the exact same angle already. Write a script, draw out a storyboard, and create a shot list before you start filming. Plan your b-roll shots so you have extra footage when it comes time for editing (more on that below). If you think writing a video script is the same as writing a blog post — think again. Here are Column Five’s best tips. 3. Be selective when choosing video subjects. Set high standards when casting actors for your projects. Pick someone who can deliver dialogue naturally, who can memorize lines, and who isn’t stiff in front of the camera. If possible, plan time for a few run-throughs to work out any mispronunciations or giggles. 4. Carefully consider the set. Don’t try to fool your audience by “set dressing” your office to simulate another location. Your audience is paying close attention to every detail of your video. 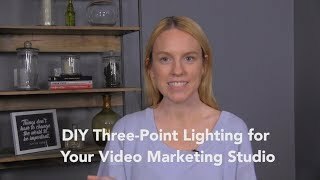 Shoot your video projects in locations other than your office — in front of textured and interesting backdrops, but ones that also aren’t too busy. 5. Be cognizant of sound quality. Don’t come off as an amateur with poor sound recording quality. Use lapel or lavaliere microphones — both of which are hands-free — when shooting sit-down interviews, or use microphone and boom setups for bigger shots. If you’re filming a video with a smartphone, you can purchase microphones that fit into the phone’s headphone input to quickly and easily improve sound quality. Use a tripod to keep your video stable — and not wobbly, as it most certainly will be if you hold it yourself. Get a standing tripod or a tabletop tripod for tighter shots to keep your video looking professional. Make sure the camera is in focus — and then lock the exposure so it stays in focus. Be mindful of keeping shots white balanced to keep lighting neutral and even, too. 9. Obey the rule of thirds. 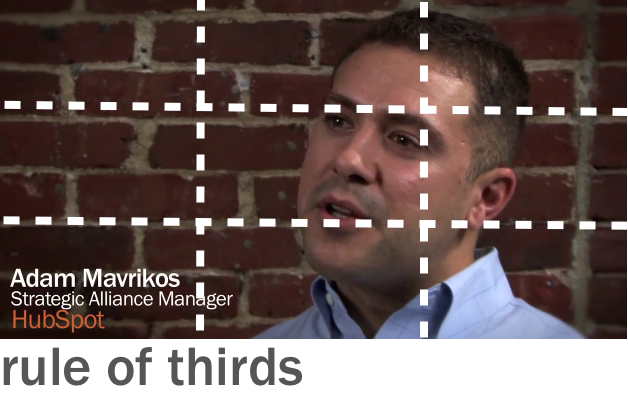 The rule of thirds involves splitting up your shot into thirds, horizontally and vertically, and framing your subject off-center. It creates movement and life in your shot the way a straight-on, centered shot wouldn’t. Make sure your content is remarkable and tailored to your target audience. Edit your video so that it gets to the point, and doesn’t drag on. Remember, you don’t have long to capture (and hold) your viewer’s attention, so make sure that the beginning of your video is engaging, informative, and relevant to the viewer, and that she’ll clearly understand the message. 10. Align the flow of the video with the emotional response you want to evoke in viewers. The tone, structure, and pacing of your video have a major influence on its effectiveness and the emotional impact on your audience. Tell a story that would be compelling to you — build tension and drama by arranging shots according to your storyboard and script. Cover up your cuts with b-roll footage that complements the narration. You can find b-roll and other stock footage on sites like Vizeedy if you didn’t film it yourself, but it’s best to keep your shots all in the same setting to maintain the video’s consistency. Take the extra time to go back and film more b-roll if you need it. Light background music can cover any ambient sound and provide tone and emotion to your video that words and images otherwise can’t. You can find royalty-free stock soundtracks that you’re allowed to use on sites like AudioMicro — make sure you’re not using songs that are licensed, or else it could result in your video getting taken down. Keep the style of your text and titles simple, classy, and sharp. Choose a clear and bold font, keep words on your video screen to a minimum, and use text animations to keep the viewer engaged with new additions to the video they watch. 14. Optimize your video for the platform. Be mindful of where your video will exist while you’re editing. Is it for your website, YouTube, or Facebook? Each platform has different specifications — for example, on Facebook, where 85% of viewers watch videos without the volume turned on, you’ll want to use captions, so people can follow along without the sound. YouTube videos don’t count views until someone watches for 30 seconds or more, so make sure the first 30 seconds are as interesting and eye-catching as possible.